New - Exeter Pubs by David Cornforth. On the 17th January 1983 a revolution in British broadcasting occurred when BBC TV first broadcast their morning Breakfast show – it was delibarately timed to open two weeks before TV-am went on air. On the day that the Breakfast show opened, BBC Radio Cornwall and BBC Radio Devon also started broadcasting across the south-west. The two stations replaced Morning Sou'West which had previously been broadcast on the local Radio 4 frequencies. BBC Radio had been solely based in their Plymouth studios, but BBC Radio Devon was split between the old Plymouth studio and new, purpose built, studios in Exeter, which would become the main programming centre. This was a controversial move at the time, and Roy Corlett, the station manager at the time said "We took a lot of flack from civic leaders in Plymouth". In 1993, Exeter became a feed to a new Plymouth studio. In 1982, the BBC opened a temporary office in an end terrace house at 65 St David's Hill while the studios were constructed. Along with the portacabins on the building site, the house served as the production office, newsroom in an upstairs bedroom, a managers office and the engineers were in the old kitchen at the back. A site near Walnut House off St David's Hill was selected for the studios. The Exeter Building and Construction Group (became ROK) were the chosen builder. The total cost was £1.5 million, of which £750,000 was equipment for video and audio editing, as well as the broadcast studios. The project was delayed and on the first day of broadcast, temporary portacabins served as studios. Unusually for the BBC, they opened their new service a couple of years after the commercial Plymouth Sound and DevonAir commenced broadcasting. Corlet stated "It's the first time the BBC have come to an area second... We aren't just competing with DevonAir, but also with Plymouth Sound". Chris Loughlin presented the first programme "Countywide" . Alan Urry was at the controls of the Mk 1 Desk in Plymouth, while David Read read the first news bulletin. Initially the service operated from 6am to 6pm under the name of Devon County Radio – the intention was to cover current affairs, news, phone-ins and discussion programmes. At the weekend programmes include farming, the arts and religion. The aim was to go after the over 25 market. Local programming from outreach studios at Barnstaple, Plymouth, Newton Abbot and Torquay were also planned. On 30th September 1983, the studios at Walnut Court, as they are known, were formally opened by Alastair Milne, the Director General of the BBC at that time. In 1986 a "Type C OB Van was purchased to aid in setting up amd making outside broadcasts – the need to transporting separate mixers and other equipment ceased as everything was built into the van. 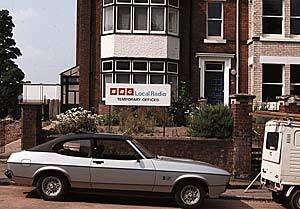 The first radio car was a Mk3 Ford Cortina. Almost thirty years later and the station has settled into the rhythm of Devon. Regular local weather and traffic updates are featured in the programming, with Snowline being particularly useful during the winter moths. BBC Radio Devon programs have won several Sony Awards, once linking up with Boston, Massachusetts for a live broadcast on New Years Eve. The studios also have video editing equipment, allowing East Devon based reporters to prepare a package for Spotlight, which is broadcast from Plymouth. Former presenters include David Willis, Craig Rich and the late Jill Dando. Source: Exeter Weekly News 03/12/1982, Wikipedia and www.devcountyradio.freeuk.com. The temporary offices at 65 St David's Hill for BBC Radio Devon before the Walnut Gardens studios were opened.